Hill's® Ideal Balance™ Soft-Baked Naturals with Chicken and Carrots / Gee Whiskers! I always get so excited when parcels get sent for Scamp. I can't wait to get home to him so that I see his expression. Recently Hill's sent Scamp an Easter treat packaged in such a cute way - the wrapping was made to look like a rabbit. As soon as Scamp saw it he wanted up on the kitchen counter to inspect the parcel. The funny thing about it is that the parcel was almost the same size as Scamp so he didn't know what to do at first. Scamp loves "destroying" things so it makes watching him unwrap things very entertaining (luckily he knows he can only destroy things we give him to tear apart). 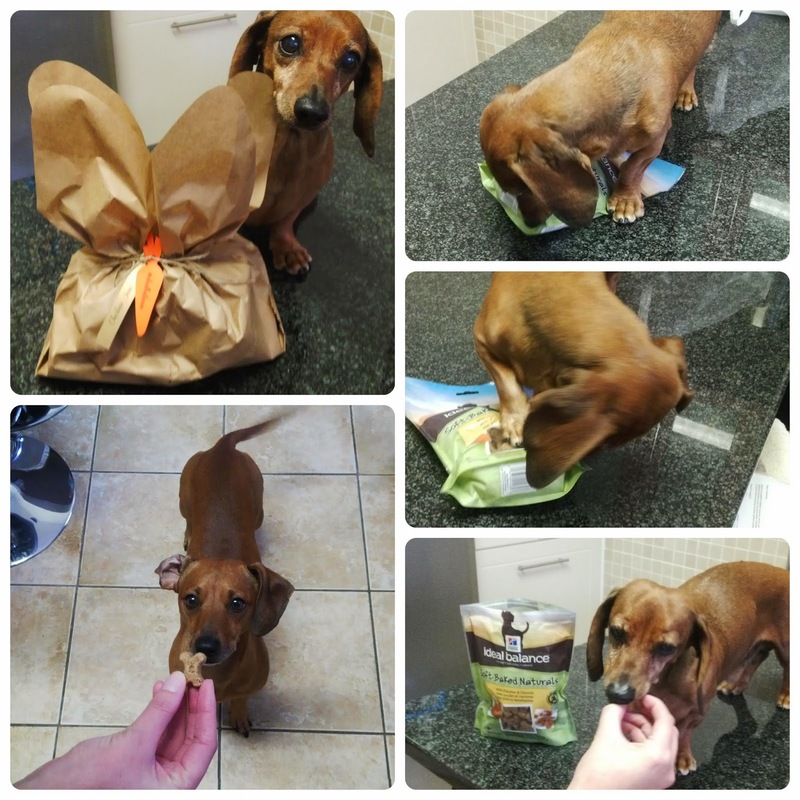 He ripped open the brown paper and immediately wanted to get into the bag of treats. Hills sent him a bag of their Soft-Baked Naturals with Chicken and Carrots. This is the perfect kind of treat for Scamp because being 14 years old, he can't easily eat hard biscuits anymore. Boy oh Boy he LOVES these treats. I let him have quite a few of these treats on the first day and he just wanted more and more. His "brother" Milo also really seemed to like these treats. My dogs are not the biggest fan of biscuit type treats so I was thrilled to see just how much they loved these. These treats are part of the Ideal Balance range which means that it's a good nutritional treat for your dogs. The main ingredient is real chicken and no corn, wheat, soy or artificial preservatives and flavourants are used. A 227g bag costs R55 and is available from vets and vet shops who stock Hill's products. A big thank you to Hill's for treating my little Scamp and Milo to these treats. For more information speak to your vet or visit www.idealbalance.co.za or #idealbalance. To join a community of people passionate about their pets, join the Hill’s Facebook page www.hillspet.co.za/facebook or Twitter www.hillspet.co.za/twitter. Their treats are the best ! My doggy Gemi loved them (she passed away Tuesday morning, she was also 14 years old ) because they weren't hard biscuits.